Wells Pools is committed to offering our customers the best value available by providing excellent customer service, superior construction and top quality pool equipment at an affordable price. As a true custom builder with a unique design approach, Wells Pools' dedication to building your pool on time and on budget makes us the #1 family owned and family managed choice to transform your backyard into a summer paradise. Wells Pools, the original "GREEN" ECO-Smart Pool Builder in Sacramento, combines the best equipment, low maintenance features, low energy use, and long lasting products in to one complete and incredible pool package, expertly designed and built for a lifetime of lasting memories. We understand that you're busy, so every appointment we set is based around your schedule at a time that works best for you. And from the 100% financing options to full landscape packages, Wells Pools is committed to providing you with the ultimate in customer convenience and satisfaction. Choosing the right pool builder can be a daunting task, which is why at every first appointment we are on, we will leave you with our "How to Choose a Pool Builder" publication. It will help you choose a builder that will be there for as long as your warranty which for us is LIFETIME. The Wells family has been building pools for more than four decades. We're family-owned and operated, fully licensed and insured, and have the experience and skills necessary to make your backyard dream become a reality. Rex Wells, the owner of Wells Pools has been building swimming pools for over 20 years. Unlike other pool companies that say they are "family owned", Wells is not only family owned, but family operated as well. Rex is acting construction manager on every pool project and is on-site for every major phase of construction. Rex's nephew Joel is Wells Pools' expert designer and sales manager. And you can find Rex's wife Kim running the office, handling customer service and keeping the boys (and your project) on schedule! We pride ourselves on our ability to work closely with our customers to create the professionally designed pool of their choice and to provide the best value we can. We have established a solid reputation of building pools as quickly and efficiently as our top quality standards will allow; No one builds a stronger, more durable pool than Wells Pools, which is why our construction and equipment warranties are among the finest in the industry. Our commitment to quality and customer satisfaction is the number one reason nearly all of our customers are referred to us by either satisfied Wells Pools owners or professionals in the pool industry who respect our work. There are lots of reasons why Wells Pools has been so successful in satisfying homeowners throughout the greater Sacramento Valley area for so many years. Here are our "top 10" favorites. 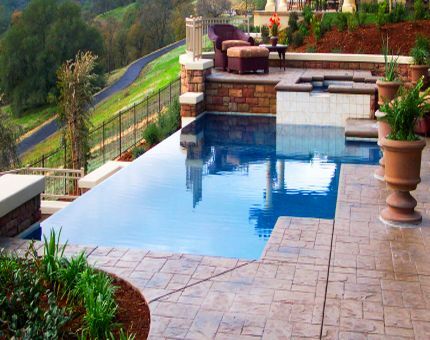 Experience - We have more than 40 years experience in designing and building pools and spas in this area. “All Things Leisure” – We do a lot more than just swimming pools. We can offer you a “Total Backyard” solution. Energy-Efficient and Low Maintenance – We strive to design and build energy-efficient, low maintenance swimming pools, spas and backyard areas. The BBB – we must be doing some right, to maintain an A+ Rating with the BBB. Extensive Referral Record - Nearly all of our customers come to us through referrals by other satisfied Wells Pools owners. This is the best compliment we can receive. Quality / Price - We’re committed to use only the finest materials, equipment, and contractors available, but keep our overhead low, so that we can offer extraordinary results at a competitive price. No-pressure Sales Philosophy – We don't ever want to pressure anyone into a sale. Family-owned – It's our family name that goes on every pool we build. So you can bet we care about the results! Lifetime Guarantee – We guarantee your swimming pool shell will be "leak-free" for as long as you own it. We are family owned and operated - proudly serving Sacramento, Roseville, Rocklin, Granite Bay, Loomis, Folsom, El Dorado Hills, Cameron Park, Auburn, Lincoln, Elk Grove, Galt, Lodi, Jackson, Dixon, Davis, Vacaville, Napa, Placerville and Fairfield. Over the years, we've partnered with and/or become members of various swimming pool related organizations – many of which most homeowners have never heard of. So the following section helps explain what each of these organizations is, and why it should make a difference to you that Wells Pools is associated with them. Online Business Practices for online businesses that apply for the BBBOnLine Reliability logo, and cooperate with the BBB in matters relating thereto. Often imitated, never duplicated, Pebble Tec®, Pebble Sheen®, Pebble Fina® and Bead Crete® brand pool finishes help create the kind of luxurious, durable pools, spas and water features that provide a lifetime of inspiration and relaxation. We are a licensed dealer of Pebble Tec and have a team of fully trained professionals to install Pebble Tec pool finishes for your pool.